For other uses of the word "particle" in physics and elsewhere, see particle (disambiguation). All particles and their interactions observed to date can be described almost entirely by a quantum field theory called the Standard Model. The Standard Model, as currently formulated, has 61 elementary particles. Those elementary particles can combine to form composite particles, accounting for the hundreds of other species of particles that have been discovered since the 1960s. The Standard Model has been found to agree with almost all the experimental tests conducted to date. However, most particle physicists believe that it is an incomplete description of nature and that a more fundamental theory awaits discovery (See Theory of Everything). In recent years, measurements of neutrino mass have provided the first experimental deviations from the Standard Model. The idea that all matter is composed of elementary particles dates to at least the 6th century BC. In the 19th century, John Dalton, through his work on stoichiometry, concluded that each element of nature was composed of a single, unique type of particle. The word atom, after the Greek word atomos meaning "indivisible", denotes the smallest particle of a chemical element since then, but physicists soon discovered that atoms are not, in fact, the fundamental particles of nature, but conglomerates of even smaller particles, such as the electron. The early 20th-century explorations of nuclear physics and quantum physics culminated in proofs of nuclear fission in 1939 by Lise Meitner (based on experiments by Otto Hahn), and nuclear fusion by Hans Bethe in that same year; both discoveries also led to the development of nuclear weapons. Throughout the 1950s and 1960s, a bewildering variety of particles were found in scattering experiments. It was referred to as the "particle zoo". That term was deprecated after the formulation of the Standard Model during the 1970s in which the large number of particles was explained as combinations of a (relatively) small number of fundamental particles. 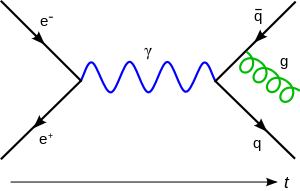 bosons, and the photons. 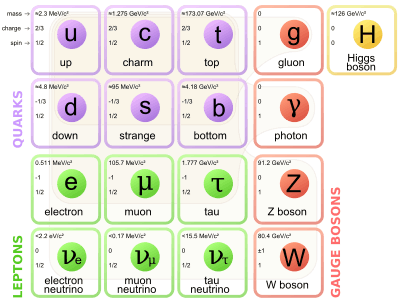 The Standard Model also contains 24 fundamental particles, (12 particles and their associated anti-particles), which are the constituents of all matter. Finally, the Standard Model also predicted the existence of a type of boson known as the Higgs boson. Early in the morning on 4 July 2012, physicists with the Large Hadron Collider at CERN announced they had found a new particle that behaves similarly to what is expected from the Higgs boson. Brookhaven National Laboratory (Long Island, United States). Its main facility is the Relativistic Heavy Ion Collider (RHIC), which collides heavy ions such as gold ions and polarized protons. It is the world's first heavy ion collider, and the world's only polarized proton collider. CERN, (Conseil Européen pour la Recherche Nucléaire) (Franco-Swiss border, near Geneva). 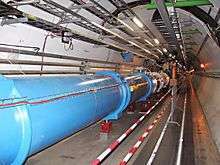 Its main project is now the Large Hadron Collider (LHC), which had its first beam circulation on 10 September 2008, and is now the world's most energetic collider of protons. It also became the most energetic collider of heavy ions after it began colliding lead ions. Earlier facilities include the Large Electron–Positron Collider (LEP), which was stopped on 2 November 2000 and then dismantled to give way for LHC; and the Super Proton Synchrotron, which is being reused as a pre-accelerator for the LHC. DESY (Deutsches Elektronen-Synchrotron) (Hamburg, Germany). Its main facility is the Hadron Elektron Ring Anlage (HERA), which collides electrons and positrons with protons. Fermi National Accelerator Laboratory (Fermilab), (Batavia, United States). Its main facility until 2011 was the Tevatron, which collided protons and antiprotons and was the highest-energy particle collider on earth until the Large Hadron Collider surpassed it on 29 November 2009. SLAC National Accelerator Laboratory, (Menlo Park, United States). Its 2-mile-long linear particle accelerator began operating in 1962 and was the basis for numerous electron and positron collision experiments until 2008. Since then the linear accelerator is being used for the Linac Coherent Light Source X-ray laser as well as advanced accelerator design research. SLAC staff continue to participate in developing and building many particle physics experiments around the world. In principle, all physics (and practical applications developed there from) can be derived from the study of fundamental particles. In practice, even if "particle physics" is taken to mean only "high-energy atom smashers", many technologies have been developed during these pioneering investigations that later find wide uses in society. Cyclotrons are used to produce medical isotopes for research and treatment (for example, isotopes used in PET imaging), or used directly for certain cancer treatments. The development of Superconductors has been pushed forward by their use in particle physics. The World Wide Web and touchscreen technology were initially developed at CERN. 1 2 Braibant, S.; Giacomelli, G.; Spurio, M. (2009). Particles and Fundamental Interactions: An Introduction to Particle Physics. Springer. pp. 313–314. ISBN 978-94-007-2463-1. 1 2 "Particle Physics and Astrophysics Research". The Henryk Niewodniczanski Institute of Nuclear Physics. Retrieved 31 May 2012. ↑ "VEPP-2M collider complex" (in Russian). Inp.nsk.su. Retrieved 21 July 2012. ↑ "IHEP | Home". ihep.ac.cn. Retrieved 29 November 2015. ↑ "SLAC National Accelerator Laboratory Home Page". Retrieved 19 February 2015.